Spike Lee’s 1992 classic film, Malcolm X, depicts the life and impact of the radical African-American activist. The poster for the movie was designed by Art Sims, who had previously created the artwork for Mo’ Better Blues (1990) and Jungle Fever (1991), two other Spike Lee joints. Past works by Sims display his affinity for photography, yet the typographic campaign for Malcolm X was a departure from this tendency as well as from tropes of 90s Hollywood film posters, both formally and conceptually. Upon further inspection, the poster reveals deeper levels of significance in Sims’ design choices. Inspired by an Olympic ad campaign along with the input of his collaborators, Sims chose two simple yet powerful typographic gestures to represent the biography of Malcolm X. He was initially inspired by a 1984 Nike ad featuring Carl Lewis hurling in slow motion through the sky, created by Chiat/Day Advertising Agency. At an exhibition of his work at the University of Michigan in 2016, Sims recalls asking Denzel Washington, the star of the movie, “Do we do the young Malcolm? Do we do the old Malcolm? Do we do the angry Malcolm? Or do we do the Malcolm before he passed away?” Washington responds, “Look, man, he’s so complicated. I don’t know what Malcolm to do. Let’s just do the X!” Sims and Lee were also fascinated by a black hat with a silver X that Sims wore while they conceived of the campaign. The poster’s bombastic hand-painted silver X embodies the influence of the Carl Lewis Nike ad, as well as the beneficial fellowship of Sims’ collaborators. The choice of typography reveals further layers of meaning that go beyond Sims’ process. The design of slab serif style typefaces coincided with Egyptomania in Europe between 1798 and 1801. Thus, this style of type has been arbitrarily referred to as Egyptian. The opening date of the movie, November 18, is listed in Caslon, which was the first typeface used to letterpress the Declaration of Independence. This document has a complex history, as it celebrated America’s independence from Britain, while many African-Americans were still enslaved. The placement of the large “Egyptian” X over small type in Caslon evokes the Black Separatist and Supremacist sentiments of Malcolm X’s agenda—all of this while utilizing the device, X, that detached him from his slave-owner given surname. Movie posters are typically didactic in their efforts to represent the entire plot of a movie in one frame. Designs for other notable films from 1992, such as Basic Instinct, Sister Act, Batman Returns, Candyman, and Last of The Mohicans, all follow the trope of featuring the star along with images that generally represent events in the movie. The Malcolm X poster doesn’t show Washington or credit the cast and crew, the production company, or even Spike Lee himself. 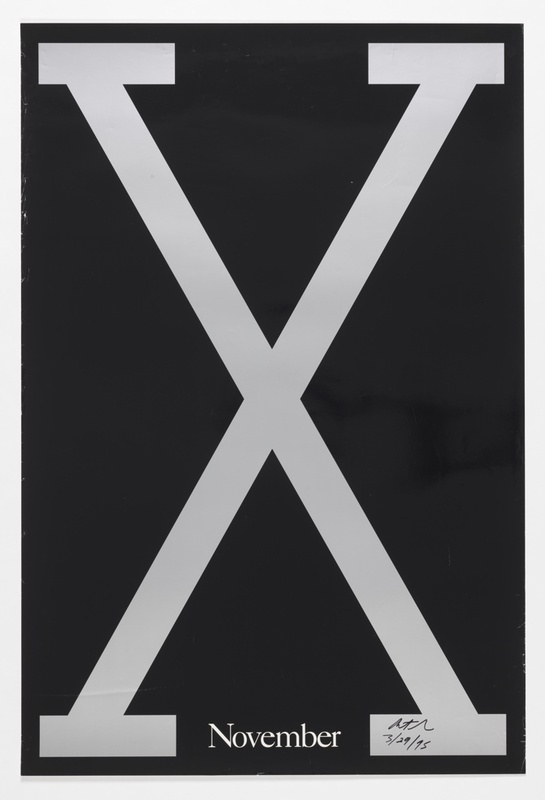 This radical gesture reflects X’s devotion to equality, “by any means necessary.” A quarter-century later, the poster is still distinguished amongst its contemporaries as a typographic masterpiece that shows the ways in which the film’s individuals—director, designer, star actor—and their collective work, as meaningful efforts—as African-Americans—to pay homage to Malcolm X’s contributions to society. Jerome Harris is a Graphic Design Teaching Fellow at MICA (Maryland Institute College of Art) and an independent graphic designer. He recently curated the exhibition, As, Not For: Dethroning Our Absolutes, at MICA, celebrating the work of African-American graphic designers, sharing work created between 1865—1999. Art Sims’ Malcolm X poster is exhibited in the show.